As many as 87 million people had their Facebook data inappropriately accessed. Here’s how to check if you’re one of them. Last week, Facebook said that 87 million of its users may have had their data inappropriately accessed by Cambridge Analytica, the British political data firm that worked on President Trump’s 2016 election campaign. The data leak came after a Cambridge University researcher developed a personality quiz app on Facebook’s platform which downloaded people’s data, which was then passed on to the political analytics firm. Many people have been left wondering if they were caught up in the data mess, and on Tuesday, Facebook users whose data was compromised should have received a notification when they opened their accounts. FYI, it seems like after you view it once the notification doesn’t show up again. 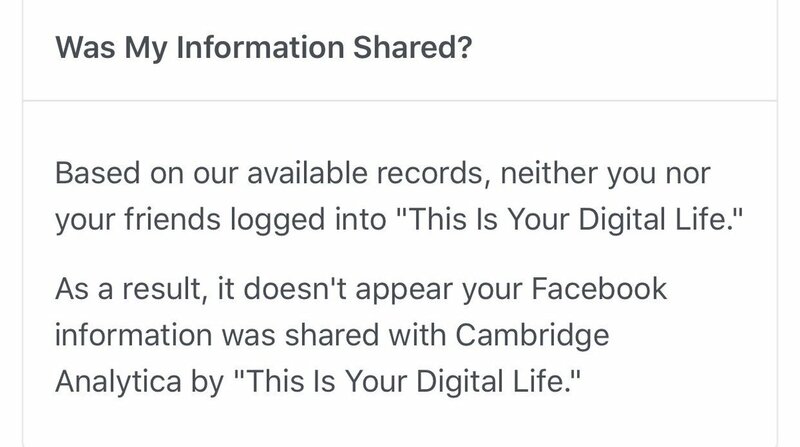 But here’s a key point: you didn’t need to take the Cambridge personality quiz for your data to get shared — all it took was for one of your Facebook friends to have done so. As such the 270,000 people who took the quiz gave the app access to tens of millions of their friends’ data. If you didn’t receive a notification, then you can still check to see if your data was shared with Cambridge Analytica by going to the Help Center or clicking here. If your data wasn’t compromised, you’ll see a message saying that you’re safe. That way you can help them figure out whether their personal data has been compromised or not.